Thank you for being helpful when I called. The back patio is a great place to relax and very dog friendly. Team members were very efficient and for the most part informative. I called the day before we arrived and asked if there were lawn chairs. I was told that they did not think so. My husband has a bad hip and needs to sit so we bought one on Portland only to discover 6 brand new chairs. We loved the house. The pictures were recent and depicted actual condition of property. The property is dog friendly and had lots of amenities that supported dogs (dog run, dog towels, room inside for dog etc). The owners took the time to build and furnish a very comfortable rental property. Towels and furnishing were higher end materials which was very nice. We enjoyed our stay and would consider returning again. Although the property was dog friendly the inside was very clean. The kitchen and amenities were well stocked. Plenty of pans etc. Plenty of towels provided. The backyard was nice to just sit and relax. Overall the house was very large and comfortable. The team was so responsive to all of my emails and questions. This property is amazing! The location is close to the beach, Seaside, Tillamook and Cannon Beach. You can also walk to the beach from the house. The kitchen is well stocked and wonderful to cook in! The open floor plan makes spending time with your family easy! I can't wait to come back! Originally called and janet, I believe, was very welcoming and helpful with my questions and concerns about where I should stay. It exceeded my expectations. I look forward to either returning to this property or exploring other options your wonderful company has to offer. As this was my first time using your company I look forward to many years of Memory Making with you guys. Thanks a million! The property exceeded our expectations! We have rented many places and I was so pleasantly surprised at the little things that make a huge difference like having a clean sponge in the kitchen and providing plenty of toilet paper. I will definitely rent through your company again, I hope to even rent the same location again. It was a lovely home, very clean, and plenty of space and seating!! "Tell us about your favorite feature" I can't list just one... As clean as it looked in the pictures! A new sponge in the sink! Plenty of bedding! Laundry detergent provided! Plenty of toilet paper/paper towel/garbage bags! Easy in/out with key pad! Comfortable beds! Well kept! Lots of room! Extra family room/deck was fabulous. An outside picnic table would make everything perfect! 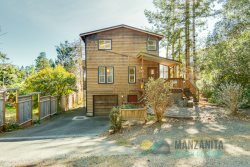 Very comfortable house in the heart of Manzanita. Seamless and easy stay. "This was one of out best Airbnb experiences to date. Location was great for a walk to downtown or the beach. Appointed very nicely. Very clean." Gated deck and fenced yard so safe and convenient for our furry ones!! Our only complaint was that this particular house was not walkable either to the beach or to town. However the area was quiet and there was a nice walkable area on the culdesac. Property was clean and comfy in every way. The house was great and great location but the only thing we didn't like was that we were woken at 7am every morning by all the construction going on outside the house. It was so noisy all day long. That was a pity as we went there to have a nice relaxing holiday MANZANITA BEACH GETAWAY'S RESPONSE: Leon is correct, yes unfortunately there is temporary construction on Carmel that operates during the week. The summer is a very busy time for construction on the coast, but each business in the area does not always get notice of when and where this will take place. However, we are grateful for the feedback, and that he enjoyed the home! It does offer beautiful views, conveniently located, and this guest was great we hope to have him back!